Thanks to those who came along and listened. Am delighted that we will be having our first external speakers at Mobile Monday Edinburgh at our next event on 31st August. OMTP's BONDI has been quietly making progress for a few years now towards defining a standard interface for providing secure access to handset features from inside web apps and widgets. They have suffered from the usual chicken-and-egg problem for such new standards with low developer interest due to small number of supported devices, and low support due to lack of apps, so I was pleased to see recently that a swath of new LIMO devices have been launched with BONDI support, to add to their existing Windows Mobile footprint. Looking forward to hearing more about their work both at MoMoEdi, and at the mobile barcamp they are running on 3rd September. Following on from Volker's excellent carnival #178 last week, I am delighted to host this week's Carnival of the Mobilists. I will kick off with a post by a fellow Scottish mobilist, Richard Marshall, who asks who will be the Railroad Barons of Mobile? He considers the development of the mobile apps business and draws an interesting parallel between the opening of the American west during the gold rush and the recent rollout of the mobile app stores. A thought provoking read and my post of the week. Equally thought provokingly, Mark Kramer on Smart Mobs has posted a link inspired by one of the presentations at Mobile 2.0 on Participatory Sensing, including a link to an excellent video on the subject. Alternative Reality (AR) is a theme that crops up a number of times this week. Anthony Ashbrook of the Mobile Visual Interactivity blog, carnival newcomer and another Scottish mobilist, starts at a high level and asks So what is augmented reality? Next up is an interesting overview of the use of AR in mobile marketing and apps from Andy Favell on the mobiThinking blog- though he seems to include general visual search within the definition of AR which I am not sure I would agree with. AR is an interesting area for the technophile due to the sheer range of technologies used to underpin the various services - from image recognition through to location and digital compass. It is also an excellent way to bridge the gap between digital media and the physical world - definitely a technology whose time has come. By way of disclosure I should point out that I work for Mobile Acuity Ltd. and one of our areas of expertise is AR. Taking a bit of a step back Tomi Ahonen at Communities Dominate Brands has added two more to the list of C's of cellphones - Cyber and Context. The former covers everything from AR on one hand to connected pets and plants the other. He defines the latter as being to do with the "human need to let people know our status" - rather than more technical things such as location, though I am not entirely convinced by that distinction. Looking a little further forward Russell Buckley at MobHappy speculates about Mobile Phones in 10 Year's Time - leading to a conclusion that many of us oldies who can't cope with such a closely integrated future will end up in "sheltered accommodation, which offer largely tech free environments" - nice one to look forward to Russell! For stat-o-philes there have been a couple of interesting posts this week. Peggy Salz of MSearchGroove expands on a presentation given at Mobile Advertising UK in London last week describing the key findings of a survey of 1000 UK mobile users. This will provide the basis for a Mobile Advertising UK report due in July. She follows this up with an audio interview on the implications with Rory Sutherland of Ogilvy UK. Looking further afield Phil Barrett provides a presentation he gave at Marketing Magazine's Mobile 2.0 conference in Toronto in which he compares the relative merits of downloaded and web applications on mobile based on the stats in the Canadian market. Thanks to everybody for providing such an interesting and stimulating collection of thoughts and ideas. Next week's carnival will be hosted by Rudy de Waele over at mTrends. An excellent turnout of 18 people (causing issues with getting extra tables - but a nice problem to have ;-) gathered in the downstairs private room of Centotre in Edinburgh last Monday for a pleasant lunch with lots of mobile chat. Some more photos were taken were taken to add to the MoMo Edinburgh group on flickr. Richard Marshall of Rapid Mobile kicked off an interesting discussion about mobile App stores, initially looking for thoughts about the Nokia Ovi store. This broadened into a more general debate about whether the other stores could replicate Apple's success, supported as it is by the public trust in their brand, the existing billing relationship created by iTunes, and the advantage of minimal hardware fragmentation. It was noted that the rash of new store launches has created a conflict between operator focused stores on one hand, and platform focused stores on the other. Also, while fragmentation is still a hard problem, the huge numbers of Nokia java phones in the market, addressable via Ovi, represent a huge commercial opportunity. Gavin Dutch of Hedout then moved the discussion on to the problems of taking conventional credit card payments in mobile apps and web services. It was noted that APIs intended for webapps, e.g. from paypal and the like, could often be used, though security systems like 3D secure can be a problem in some cases. Discussion then moved on to contactless and mobile payments, and it was noted that the major credit card networks are now rolling out NFC readers in the UK. The next event is planned for the 6th of July and anybody interested should make sure they are signed up to the google group. PS. Thanks to Vero at Taptu for giving a mention of my previous post about MoMo Edinburgh in her recent carnival of the mobilists. I spent a fun day on Saturday at BarCamp Scotland meeting lots of interesting people (old and new) from the software community in Scotland. After a very amusing and typically Scottish first 20 mins with everybody milling around a safe few paces away from the sign-up boards not wishing to be first, an excellent program of talks and discussions came into being which kept the six presentation zones running for the vast majority of the day. One of the early speakers was Ewan Mcintosh from 4IP, a major sponsor of the event, who gave an interesting 30 minute outline of what 4IP was supporting and some key tips on how to effectively engage with them. He described how he sees media being divided into a series of spaces: watching, participating, performing, publishing, group, and secret. The next talk I saw, and at the other end of the corporate scale, was by Cole Henley who in his spare time has created tinyadr, a system for effectively publishing contact details over the web in place of traditional printed and static business cards. It uses the hCard HTML microformat to embed semantic information into the markup which was new to me. The ever entertaining Mike Masnick of Floor64 and Techdirt fame was in town for the week visiting Informatics and the Business School. On previous days I had heard him speak on the history of Silicon Valley and how they had created floor64. This time he spoke about one of his pet subjects - the danger of protectionism and why giving things away for free can make sense. The core of his argument is that goods are broken down into two groups - those which can be reproduced at no cost which he describes as "infinite", and those which have real costs to reproduce/create and are thus "scarce". He states that to maximise your market you should give infinite goods away for free and seek to monetize based on associated scarce goods. Creating artificial scarcity in infinite goods - i.e. protectionism of various sorts simply inhibits growth of the overall market. Next up Michael Clauser of Gadder (amongst many other places!) talked a little about their automatic prospect data-mining solution, which combines automated search of the public internet with sophisticated natural language analysis in order to assist researchers find relevant background on individual prospective partners quickly and effectively. BarcampScotland: What Is Visual Interactivity? After a coffee to recover I listened to Fred Howell of Textensor present their new A.nnotate.com cooperative document review/annotation system. This web based system allows users to upload documents in a number of standard formats. Representations of the document can then be viewed by the user as well as any other users they choose to invite and comments and discussions can be attached to sections of the text using a postIt like metaphor. Finally Jonathan Brown of Blue Droplet Media presented on his Drupal Openpackage Video module - which handles upload, transoding and serving video within Drupal based web applications. The day finished in the Library Bar in Edinburgh University's Teviot House where I had an interesting chat with Andrew Williams about the progress and direction of Maven in general, and his own headsupdevelopment project in particular. All in all it was an excellent event - and look forward to going again next year! ps. The latest carnival is up over at Vision Mobile. There are a wide range of interesting events being hosted in Scotland at the moment, and on Saturday I went along to the annual Barcamp Scotland hosted by Edinburgh University Informatics Ventures and 4IP. A series of interesting speakers visit the Business School and/or Informatics, and their events are incorporated into The Edinburgh Internet Marketing Meetup etc. On more of a technical theme there is the techmeetup which provides that unbeatable mix of a strong technical theme along with free beer and pizza! On a wireless/mobile theme Wireless Innovation run a series of interesting events at Hillington Park Innovation Centre. For the Rubyists there is the wonderfully successful (and now sold out!) Scotland on Rails at the end of the month. I understand there are still places for the charity tutorial day - learn Ruby and Rails from Chad Fowler and Marcel Molina no less! There are various rumblings about a new mobile group starting up picking up the baton from where I left off with MX Techtalk, possible under the Mobile Monday banner. And finally for those in need of caffeine in less formal circumstances a new Edinburgh OpenCoffee series is kicking off these week (pity about the slightly impractical timing :-<) to join the existing Edinburgh Coffee Morning. The latest carnival is up over at Ubiquitous Thought. There should be a new one later today over at Vision Mobile but it isn't up at the time of writing. UPDATE: Mike Coulter has posted an excellent video montage about what goes on at the Edinburgh Coffee Morning. Eclipse Pulsar: Defragmenting fragmented development??? Read an interesting story on el reg this morning about the Pulsar project which is slated to be part of the next major release of Eclipse. This is the new name for the Mobile Application Development Kit project from the Eclipse Mobile Industry Working Group. The core idea seems to be a cross manufacturer development environment for J2ME incorporating the SDK tooling from all the supporting manufacturers in a single environment which is a welcome improvement. Interestingly Sun don't seem to be welcome at this party - with JavaFX specifically not a part of the roadmap. Of course while this does help a little in reducing the fragmentation of development tools when developing J2ME it doesn't reduce the inherent fragmentation of the platform itself - the phones themselves are as diverse as ever! From this focussed and pretty sensible core idea things start to smack of design by committee with stated intentions to incorporate mobile webapp and native app development within the same environment. Unsurprisingly there is no sign of iPhone, Android or Palm WebOS support! metaTXT: Aiming for one web and gaining discoverability! One particularly interesting new contact I made at MWC last week was Sinead Quealy of visibility mobile - the mobile SEO company founded by Bena Roberts. As well as telling me about their work on mobile SEO she mentioned they were involved with pushing the "metaTXT" spec through W3C in order to improve discoverability of mobile sites. Now I have got back and the dust has settled I have had a look at the metaTXT white paper and it seems to be promising stuff. Fundamentally it is an attempt to solve the problem of supporting multiple versions of a site for different classes of device in a way that is transparent to the user - creating a practical step towards the one web ideal I have blogged about before. What is interesting is it does this by adding a small file (meta.txt) alongside the existing robots.txt at the top of the site providing metainformation about the site. The primary use of this is to provide different paths for the root page for various different device classes - which is all well and good though one webbers may quibble about not driving them via the same markup. Perhaps more interesting is the ability to provide further meta information about the site within meta.txt - in a standard form independent of any device and/or markup specifics. This can include the usual title and keywords, and intriguingly things like the location the site is related to which opens interesting possibilities for the return of context specific results for the mobile user. The primary challange they will face with all this is obviously the usual chicken and egg one of convincing sites to publish meta.txt files, and convincing search engines to look for and use them. That said they have already got a couple of mobile search providers deeply involved in the associated working group which is a good sign. Discovery is one of the key problems that needs to be solved in mobile and this may be one part of the solution to that problem. As I made my final source control commit of the day at midnight last night I reflected briefly on the less glamorous side of the run-up to the four days of frenetic activity that makes up Mobile World Congress. The past week or so has been mayhem and this week is even worse, but now the various demos, graphics and materials are coming together and things are falling into place and it is time to focus on the event itself. There are many sites out there (and m-trends is a good starting point) listing all the many parties and events striving to gain your attention and your footfall around the conference proper so I won't try to list them here - but there are a couple which deserve a special mention. Longtime mobile marketeer, blogger, and MoMo London co-organizer Helen Keegan has worked up her usual magic to create not one, but three different events this year. Swedish Beers has moved onto the Wednesday night and into a bigger venue - that being a really good thing after the crush at Belchica last year! Not satisfied with that she is also working with UKTI to organise a fascinating lunch event focussed on the Future of Mobile, and I understand will be announcing a third and final event "for the ladies of mobile" tomorrow. It is interesting and encouraging to see that despite the economic troubles of the world at large that sponsorship for so many events is still forthcoming. That said it will be interesting to see what the overall visitor numbers end up being. 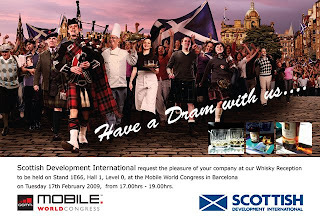 Many of the "usual suspects" to turn up to the whisky reception are taking a year off MWC - the Americans in particular. If you are in the exhibition do come along and enjoy a dram or two. This year there is competition though with Rapid Mobile having branched out onto a stand of their own in hall 7 and running their own whisky tasting starting at 5.30pm on Wednesday evening! Of course beyond the networking and socialising there will be a *lot* of new devices and services to absorb and evaluate. Will be great to get hands on the new Palm Pre in particular! One new experience this year is that we are delighted to have been invited to contribute to the mobile advertising sessions on Thursday afternoon in the conference proper - with Chris taking part in the panel on "The New Enablers" and then both of us putting various of our services through their paces in the "Entertainment & Advertising Demonstration & Networking Session". Looking forward to it! Now time to get back to eclipse and get the next chunk of that demo sorted out! "Never give out your mobile number again use your loaf.co.uk The safe anonymous way to send sms txt messages from your UK mobile phone." That is how loaf introduced themselves to the world on 19th December and at first glance it makes a very appealing proposition for the youth dating and small advertising demographics which appear to be the key markets they had identified. The core idea is very simple. Instead of being identified by your real mobile phone number when sending or receiving text messages you use your loaf name instead. All messages are sent to and from the loaf 25p MO premium shortcode - 88845. Recipients can control access to their loaf name by blocking particular senders if they so wish. To succeed the service will need to generate a relatively large volume of traffic. The rev share on a 25p premium message will barely cover the cost of the resulting bulk MT message. The tiny remaining margin will have to be multiplied up a *lot* of times to cover the company's overheads. This will be improved slightly by the "mobile-to-email" feature - sold as a bonus feature for the users but in reality a bit of a business model saver since it will reduce their bulk SMS costs and increase the revenue generated from users who take it up by at least a factor fo five! To reply via the service requires the user to manually transcribe the senders loaf name from the end of the incoming SMS to the start of the reply - this is error prone and reduces the usability of the service for the typical user. The premium messaging cost is collected on the MO which potentially creates complications for using the service since every user who publishes their loaf name is effectively advertising a premium messaging service which may raise a few eyebrows down and PhonePayPlus! In addition if the recipient has blocked that particular sender (or as below if the sender is not a loaf member!) the sender still pays the premium charge but gets nothing for it. The biggest problem with the whole thing is that both sender and recipient need to have signed up as loaf members via the website in order to communicate. If you try to send when not a member you get a rather unhelpful text response simply directing you to the website. This is a huge and possibly terminal problem for service uptake since if you give out your loaf id to someone who is not on loaf they must choose to go to the website and sign up in order to send you a message - and any mobile service that requires the user to go to their PC has little chance of success. If they could handle signup interactively on mobile that would improve the experience hugely. Hard to see why the bounce message doesn't simply push the user into a mobile internet signup page. Having spent a fair chunk of my career in mobile involved with mixipix it is really great to see Zamsana Media, who are now developing that IP, succeed in rolling out products based on that expertise in animated emotional communicontent and messaging services on mobile. They had already provided the core content for FunText, a rich messaging service which has been launched on a number of operators including 3 in the UK and Sprint in the US. Now they have launched their first service in their own right - PixMe - which has been initially lanched on Dialog in Sri Lanka as noted by local bloggers. I have no doubt we will be hearing of further launches in other parts of Asia in due course! Zamsana itself is an interesting company with a creative and corporate core in the UK, backed up by a technical team in Sri Lanka, perfect for providing services into the Asian market and beyond.